March saw the launch of a brand new orchestra in the Midlands – The People’s Orchestra – and one of the driving forces behind the project was Alvechurch resident Andy Sinclair. 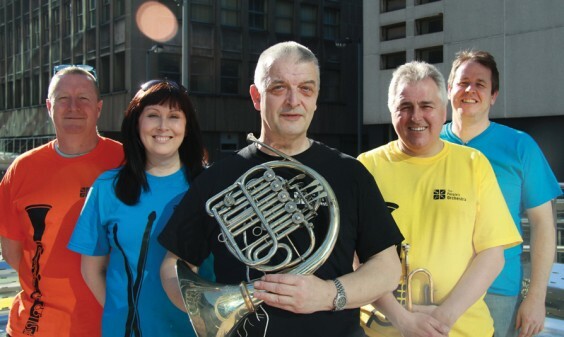 A West Bromwich community interest company called The Change Consortium, came up with the initial idea of The Mid-England Festival Orchestra, a group that hoped to fill the gap between local authority music provision and professional orchestras. Many talented musicians have their instruments taken away from them when they reach school leaving age, and if they are not fortunate enough to progress to music school, very often that talent goes to waste. Everyone loved the concept – from the local MP to the Arts Council – but in these austere times no-one was prepared to fund or even part-fund just a concept. The Change Consortium needed help and, with a background in arts marketing, having been Head of Marketing for the Alexandra Theatre and The Swan, Worcester, Andy (pictured above, far left) was well placed to provide the direction needed. Andy did, however, offer some constructive comments – these were accepted and he joined the project, instantly rebranding the orchestra to The People’s Orchestra. “There is now a two-stage process – initially a self-funded orchestra, paid for by its members and open to all players whatever their age,” explains Andy. The People’s Orchestra is all about passion, excellence and enjoyment. The repertoire will be orchestral, but more accessible – think Pirates of the Caribbean, Lord of the Rings, Harry Potter. And out goes the stuffy tuxedo to be replaced by vibrant coloured T-shirts. The People’s Orchestra already has its first concert booked for November 4, at the Adrian Boult Hall in Birmingham, and initial auditions will take place at the Custard Factory on Sunday May 6.